New to me kr1s track / road bike. It's had a bit of money spent on it over the years but still needs a bit of fettling and sorting to get right. Re-plated barrels and new pistons. Standard exhaust modified as per pics. Front forks are cbr 1000rr re valved by maxton. Rear shock is cbr600 re-sprung by maxton. Re: New to me kr1s track / road bike. Thanks for sorting out the picture mate much appreciated. Most other forums I just use the image link from photobucket? Bike was overheating, OEM gaskets now fitted and another head was fitted now running cooler. Also fitted a yzf450 radiator and new stat. Now I'm trying to sort a running issue which I have investigated and put down to blocked inline fuel filters also one carb was full of crud. I need to remove the fuel tap and check that out as well. 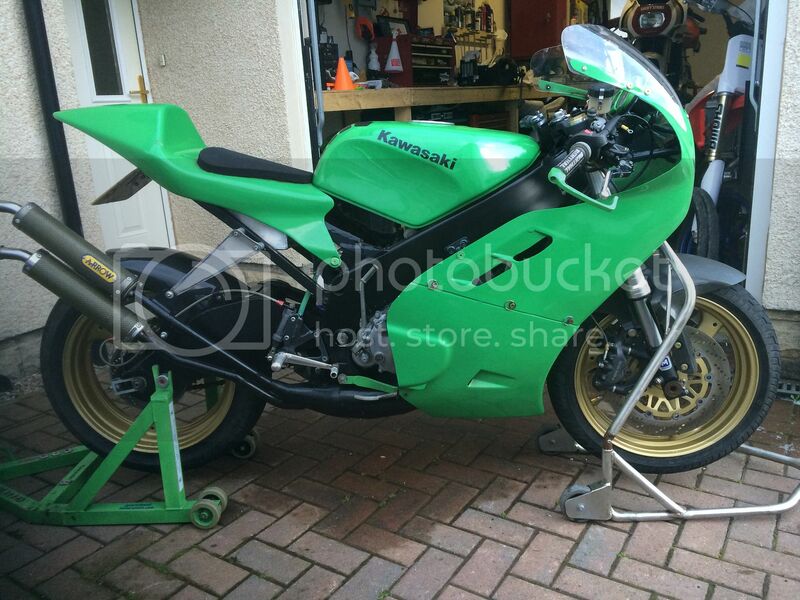 Trying to get bike reliable for track day at cadwell at end of September. Over winter bike will be stripped down and powder coated etc as it's a bit tatty in places.